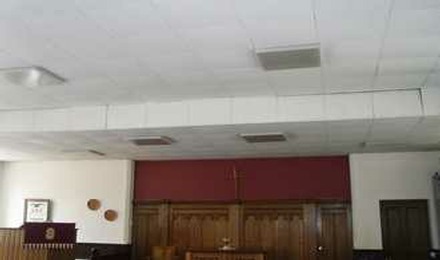 It had been discovered that the suspended ceiling over the worship area of the Methodist Church, first installed in 1966, was in danger of falling down. 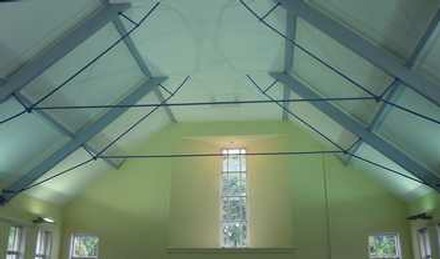 Because of health and safety concerns a decision had to be made, should we continue to have a false ceiling or should the roof space be opened up to reveal the beams once again. 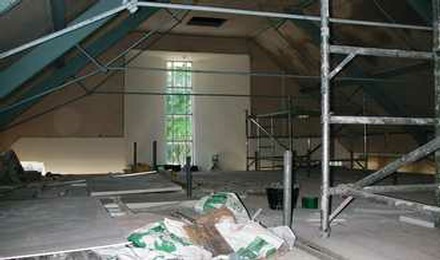 The decision was made to open up the roof space, the Church closed in May 2009 for a couple of months and Woodborough Methodist joined Calverton Methodist for their services. The ceiling was brought down with much dirt and dust!! 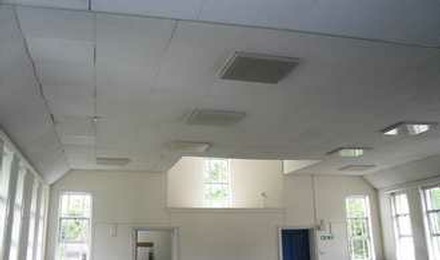 Bottom left & right: Work commenced to remove the old suspended ceiling. 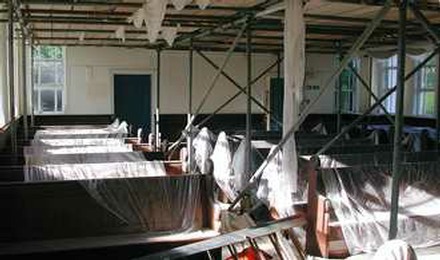 The next few weeks saw skips filled, electricians putting in new lighting, builders making good the beams and metal work, a great deal of cleaning, painting and new pew cushions. 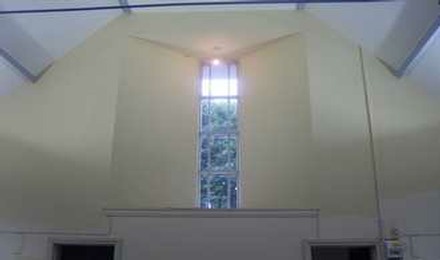 The notice boards, school room and outside were given a face-lift and the Church was ready to be re-opened. During the closure members were meeting together to plan the re-opening, it was decided to hold a ‘posh’ afternoon tea on 11th July. So, everyone busily collected china ware, sugar tongues, lace tablecloths, frilly white aprons and one of our members even wrote to the Ritz in London, who immediately replied sending some hats for the ladies to wear as they waited at table. 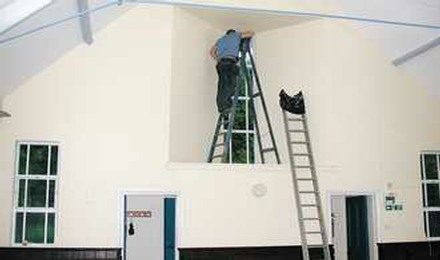 Top left & right: the area above the front entrance being decorated. 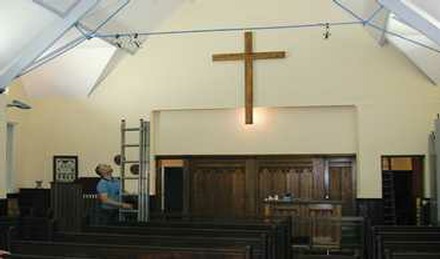 Below left: The altar end receiving finishing touches & right: The new lighting scheme. As the 11th drew near Beryl Foster could be seen raiding David and Maria Rose’s lovely garden. 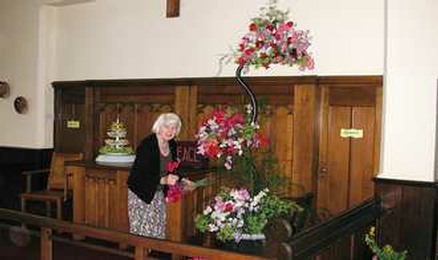 Beryl did some wonderful flower displays in the Church; a wonderful smell of sweet peas filled the whole place. All members of the Church worked hard making cream scones, fruit loaves, fairy cakes, fruit cake or cream horns. Or making rolled sandwiches and sandwiches with no crusts on, of course. 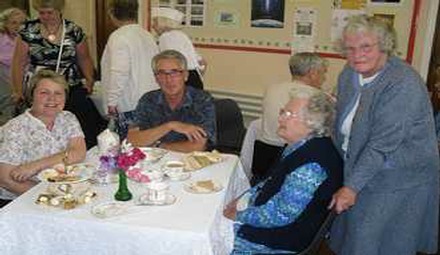 Joan Marshall as on ticket duty, David Kemp was the Maitre de, Arthur Foster and Eric Stevenson were our washers up, Freda Spencer brewed the tea, Maria Rose filled the cake stands and sandwich trays over and over again, and Janet Hill, Beryl Foster and Carol Cotton waited at tables. David Rose did a wonderful job welcoming people into the Church and explaining what had been done, whilst at the same time taking photographs. 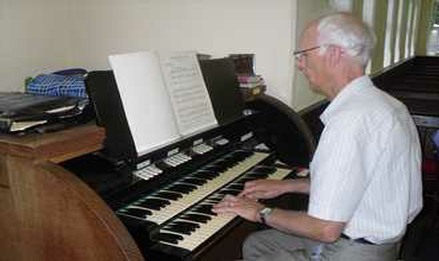 Left: David Rooke playing the organ during the open event. Right: Beryl Foster preparing the floral decorations. The Woodborough Photographic Recording Group provided a photographic display of Chapel and Church photographs from 1890's to date. Grace Goodman was kind enough to loan us a number of items for the day. We served approximately 160 people with afternoon tea and raised a significant amount of money during the afternoon. But, most importantly everyone had a wonderful time, the weather was sunny. 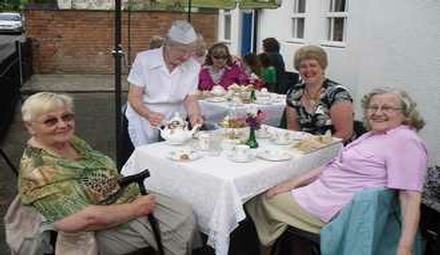 Left & right: Some of the visitors enjoying their ‘posh tea’ both inside and out. The following day, Sunday the 12th, saw our 4 o’clock service, the difference in the acoustics with the extra roof space was a great improvement. Our worship service times have recently changed to the 1st, 3rd and 5th Sunday’s, worship is at 11am. On the 2nd and 4th Sundays we are joined for worship at 4pm by members from Calverton and Arnold, where we also share a faith tea together. Woodborough Methodist is a beautiful Church and has a real place in the Community both for worshipping and serving God. Sadly the Methodist Church in Woodborough closed forever on 11th June 2017 and a closing service was held on that date with a packed congregation from surrounding churches and communities. Increasing costs of running and maintaining the building coupled with falling worshipers meant the tipping point had been reached and with a heavy heart the doors were finally closed. The cover of the booklet produced for the service is shown left, it contains the order or service, prayers and hymns.